Well, I've completed my Eros Shell. I need to get someone to take pictures of it for me, or I need to con someone into modeling it and I'll take the pictures. I really am pretty pleased with this project. I now can honestly say that I have knit a garment, and it fits. I have even begun another top. This one is Soleil from Knitty. I am knitting it in Plymouth Wildflower DK in a lavender color. I have already cast on and done one pattern repeat of the lace at the bottom. This is the first thing I have tried out from Knitty. I think that it is a pretty nifty online resource. I really found the article about choosing the correct size to be very helpful. In fact, I not only am using the information for knitting Soleil, but I also used it for my Eros Shell. Now, I just have to keep convincing myself that I can wear sleeveless tops. Well, I completed the back of my Eros Shell, minus the neckline and around the armholes with Wildflower DK. I'm taking a day or two (or whatever I need) break from it before I begin the front. I had more experience to familiarize myself with directions for shaping, and I have greater confidence in my abilities. Whilst taking that break, I decided to begin a new project. After all that stockinette, I knew I needed to get some lace on the needles, so I began Mary Ann's Cashmere & Pearls Lace Scarf by Sivia Harding. I wasn't able to immediately locate a source for 4mm glass pearls locally, so I am using 4mm AB Crystal Bicones. I've decided to knit this with my Pink Misti Alpaca. This is my first time knitting with alpaca, and I absolutely love it. I've been doing my chart prep work. I always make a copy of my charts so that I can mark them up without messing up the original. I write the number of plain knit stitches when there is a string of four or more consecutively within a row. It makes it easier to follow the chart as I knit because I don't have to stop and count boxes. I should make pretty good progress on this scarf because it's only 39 stitches across at its widest. That seems like such a small number, especially after finishing Kiri where towards the end I had over 300 stitches in a row. Yes, kids, Aunt Sarah has seen the light. Okay, so I just took another look at the pattern and realized that I was not doing all that I should have been doing. On the needles is my Eros Shell. I am new to knitting garments. I had been clicking along the stockinette portion. I only occasionally got out my tape measure because I knew it would be awhile before I reached that magic 14 inches. Well, my brain didn't register the part of the instructions which directed: At the same time, increase at the beginning and end of the row every 2 1/2 inches, or some such thing. That's right, I have not been making my increases. Ugh! Oh well, I now have a better understanding in my feeble brain for shaping garments. Now I must measure, mark, frog, and remember to breathe. I've just begun my eleventh repeat of chart two on the Kiri Shawl. This is such a lovely shawl. Many thanks are due to Polly, who generously shares this free pattern. 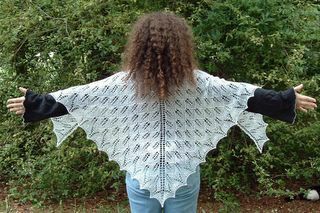 I am not knitting this in KSH, but rather with Jaggerspun Zephyr in white. I have applied to join the Yahoo!Groups KAL, and am awaiting approval. I am interested to read the experiences of other knitters with this shawl. The directions call for twelve repeats of chart two, so it would seem that I am getting close to working the edging. If you have never knitted from charts, might I suggest doing the Kiri. I know, many people are intimidated by lace and charts, and here I am suggesting you try knitting this shawl which has both. Hear me out, please. First, this is a free pattern. Second, there are both charted and written directions. Third, you have your choice of yarns for this shawl. Maybe mohair isn't as magical to you as it is to others. While KSH is recommended, you do not have to use it. I have seen it knitted in a cotton yarn (whose name I cannot recall), and I am working it up in Zephyr. This shawl is to be a gift. I mean for it to go to a June bride whom I have never met. She is my stepfather's niece. I hope she's a shawl kind of gal. I truly need to get the needles clicking, because the wedding is just over a week away. Yes, I got the date wrong in my head. I must finish this and get it in the mail.